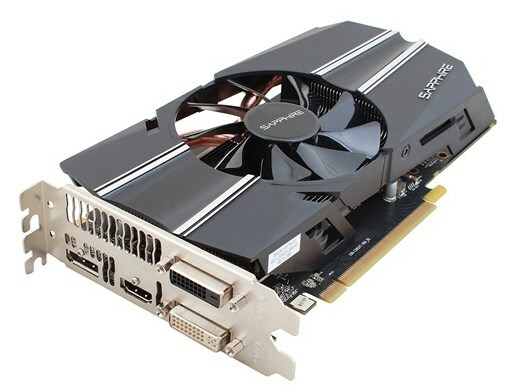 Sapphire added the HD 7790 2GB OC Edition to its lineup. This new model packs double as much GDDR5 memory, it has a 1050MHz core clock and a memory speed of 6.4GHz. The SAPPHIRE HD 7790 2GB OC Edition has 2GB of the latest DDR5 memory and is factory overclocked, with core clocks of 1050MHz and memory clocks of 1600MHz (6.4GB/s effective), to deliver new levels of performance in its price segment. Performance is optimised with the latest version of AMD’s PowerTune technology. / The 2GB board features a new cooler design, which uses a dual heatpipe system and a single aerofoil section fan assembly with dust repelling bearings for maximum efficiency and reliability. A unique and SAPPHIRE original feature is the integration into the cooling system of the metal backplate which cools the memory chips on the reverse side of the pcb and helps with pcb rigidity. A finned heatsink attached to the backplate passes through the pcb and extends into the airflow from the fan on the front side of the card, enabling the airflow to carry away the heat from the components on the back of the pcb and reducing memory temperatures to as low as 13 C.
/ Working or gaming with multiple monitors is becoming increasingly popular, and the SAPPHIRE HD 7700 series supports this with AMD Eyefinity, now in its second generation. The SAPPHIRE HD 7790 OC Edition has two DVI ports (DVI-I and DVI-D), HDMI and a single DisplayPort output, supporting up to four monitors. / The SAPPHIRE HD 7790 OC Edition model supports the FleX feature, pioneered by SAPPHIRE, that allows three digital displays to be connected to the DVI and HDMI outputs and used in AMD Eyefinity mode without the need for an external active adapter. All four outputs can be used in AMD Eyefinity mode, but the fourth display must be a DisplayPort monitor or connected with an active adapter. / The SAPPHIRE HD 7790 OC Edition can be installed in any PC with a free x16 PCI-Express slot, and communication with the host PC is optimised with the use of the latest high speed PCI-Express Gen3.0 interface. Built in hardware support for AMD CrossFire enables multiple cards to be used to further enhance performance in a suitably specified mainboard. / The SAPPHIRE HD 7790 OC supports the latest industry standards and is ready for Windows 8 with its architecture designed for DirectX 11.1, OpenGL 4.2 and OpenCL 1.2. This latest version of AMD’s Graphics Core Next (GCN) architecture also supports an unparalleled array of display and audio technologies, with new fast HDMI features (such as support for 4K resolution and full frame rate 1080p stereoscopic support), DisplayPort 1.2 certification (with support for Multi-Stream Transmission), and DDM Audio (which adds supports for up to 6 simultaneous independent audio streams). Video capabilities include native support for 3D Blu-ray (MVC Codec), DivX decode and hardware encoding of H.264 video via VCE. / APP Acceleration is the name given to the enhanced performance of a wide range of applications using the stream processing capabilities and specific hardware features of the GCN graphics architecture. The HD 7000 series has been optimised for this type of task. Typical applications include Video encoding and decoding, compression and multiplexing for media distribution, gaming or video conferencing. APP acceleration can also enhance everyday tasks such as Internet browsing, Office applications and file compression with supported software suites. / The SAPPHIRE HD 7790 series is shipping now and is available through SAPPHIRE’s established etail and retail partners. Purchasers will also receive a voucher for a FREE copy of the highly acclaimed BioShock Infinite from participating retailers.